DIgSILENT has set standards and trends in power system modelling, analysis and simulation for more than 25 years. The proven advantages of the PowerFactory software are its overall functional integration, its applicability to the modelling of generation-, transmission-, distribution- and industrial grids, and the analysis of these grids’ interactions. With the version PowerFactory 2016, DIgSILENT presents a further step towards seamless integration of functionality and data management within a multi-user environment. DIgSILENT PowerFactory is the most economical solution, as data handling, modelling capabilities and overall functionality replace a set of other software systems, thereby minimising project execution costs and training requirements. The all-in-one PowerFactory solution promotes highly-optimised workflow. DIgSILENT PowerFactory is easy to use and caters for all standard power system analysis needs, including high-end applications in new technologies such as wind power and distributed generation and the handling of very large power systems. In addition to the stand-alone solution, the PowerFactory engine can be smoothly integrated into GIS, DMS and EMS supporting open system standards. DIgSILENT StationWare provides a reliable central protection settings database and management system for the complete power system substation data, both to manage the various control parameters and to centrally store substation related information. StationWare is based on the latest .NET technology. StationWare stores and records all settings in a central database, allows modelling of all relevant workflow sequences, provides quick access to relay manuals, interfaces with manufacturer-specific relay settings software, and integrates with PowerFactory software, allowing powerful and easy-to-use settings coordination studies. PowerFactory’s data exchange facility allows it to access the settings stored in StationWare, such that these may be used as input for the powerful PowerFactory system simulation and protection setting tools. Settings that are calculated by using these tools may then be transferred back to StationWare. 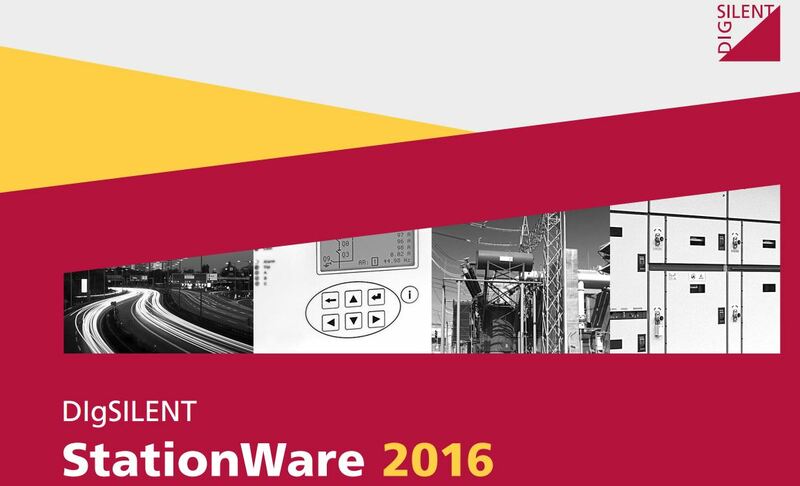 What is the idea behind StationWare? Modern numerical relays have a large number of settings that are determined, stored and communicated by proprietary software solutions (these may even be suitable for only a particular manufacturer or even a series or type of relay). This results in a fragmented and distributed settings “database.” DIgSILENT StationWare provides a single system that incorporates all such different device protocols, thereby providing one manageable software data storage system, based on modern IT techniques, facilitating data interfacing and exchange in a transparent and hassle free manner. New rules and grid codes to connect generators to the grid are emerging worldwide. In every country or region, the operators responsible for the safety and reliability of the power system have established different requirements to connect renewable generation systems to transmission and distribution networks. Such requirements are highly dependent upon the characteristics of individual power systems. DIgSILENT has developed a new verification tool called DIgSILENT GridCode. The software has been designed in response to the need to verify whether a conventional or renewable power plant is compliant with local Grid Code interconnection requirements on basis of generating unit tests. There is a new trend towards verification of requirements at the point of interconnection of a power plant using transient stability simulations with numerical models. An increasing number of Transmission System Operators are including model validation methods to quantify the risk and uncertainty when using these simulation models in stability studies. These new methods have been included in the DIgSILENT GridCode tool. The application can be automated and integrated into existing SCADA systems, but can also run on a workstation as an off-line verification tool. DIgSILENT GridCode has a new graphical user interface for easy navigation and generates customisable and automated reports in MS Word© format. Low Voltage Ride Through (LVRT): Verification of generator response during balanced and unbalanced voltage dips, verification of voltage support requirements during the dip and after dip clearance, supervision of power plant non-disconnection and/or supervision of active power recovery according to the user selected grid code. High Voltage Ride Through (HVRT): Verification of generator response during balanced and unbalanced voltage swells, verification of voltage support requirements during the swell and after swell clearance, supervision of power plant non-disconnection and/or supervision of active and reactive power recovery according to the user selected grid code. 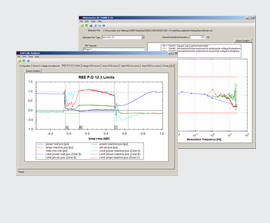 Model validation: LVRT or HVRT simulation results are compared against field measurements according to the user selected method to check that both data series fit well. Power Quality requirements: Flicker and harmonic levels can be assessed according to classical International Standards (IEC-61000-4-15, IEC-61000-4-7) or according to specific methods for renewables (IEC-61400-21, TR3). ENTSO-e Network Code for Requirements for Grid Connection Applicable to ALL GENERATORS (26th June 2012). China GB/T 19963 – 200, State Grid Corporation and China Electric Power Research Institute. Germany: EEG: Renewable Energy Sources Act, measurement procedure by FGW – TR3 for medium and high voltage networks. South Africa: “Grid Code compliance test for wind energy facility connected to transmission or distribution grids in South Africa” by Eskom. Spain: Update to the new version 10 of the PVVC to check compliance with P.O.12.3 and P.O.12.2 (draft). Event classification: voltage dips, voltage swells, balanced or unbalanced events. Shortcuts for fast access to configuration parameters. The Demo Version of DIgSILENT GridCode v2.0 is a limited commercial version available for evaluation during a period of 30 days. Execution and computation available for predefined input files. Grid Code editor is fully available; the voltage dip shape can be modified, active power and reactive power requirements in zones, etc. The resulting grid code conditions can be checked with the demo files. Editing options as copy/paste graphs, export option to csv format, and other powerful edition capabilities. The PowerFactory Monitor (PFM) is multi-functional Dynamic System Monitor which fully integrates with DIgSILENT PowerFactory software. The PFM features grid and plant monitoring, fault recording, grid characteristics analysis by offering easy access to recorded data, analysis of trends, verification of system upset responses and test results. Unbundling of electricity supply systems and the introduction of new technologies in all areas of generation, transmission and distribution has made power system operation more complex. Supervision of generator performance according to Grid Codes and Connection Conditions, the stability supervision of large transmission networks at specific locations, verification of power quality criteria in distribution as well as the determination and analysis of key system parameters has generated the need for power system monitoring and grid supervision beyond classical fault recording and SCADA based trending systems. Under those aspects, wide area monitoring (WAM) via phase measurement units (PMU) is just one special feature out of all monitoring applications. The PowerFactory Monitor fully integrates with DIgSILENT PowerFactory software offering easy access to recorded data, analysis of trends, verification of system upset responses and test results. The DIgSILENT PowerFactory Monitor is an integrated, multifunctional data acquisition system that covers recording, monitoring and analysis of signals in all relevant time frames. It is especially designed to cover all needs of Transmission, Distribution and Generation on all voltage levels. Flexible hardware and software components allow for the configuration of portable systems, stand-alone cabinet mounted installations as well as LAN based multiple units, multiple location systems being coordinated and supervised via Master Stations. Any quantity deviating from normal conditions is recorded and analysed. 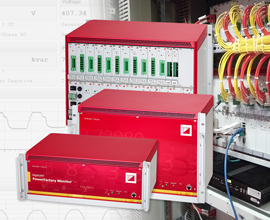 In addition, on-line analysis of signals is provided featuring the detection of inherent problems like system and control oscillations, deviations from connection conditions or power quality aspects. The PowerFactory Monitor is a stand-alone system including all necessary hardware and software functions for signal conditioning, signal conversion, data storage and processing, calculation and documentation. In addition, remote access is possible via modem, TCPI/IP networks, WWW and special SCADA interface techniques. Several monitoring systems can be synchronized to 1œs using GPS clock for precise parallel sampling, e.g. a basic requirement for system wide area phasor measurements.